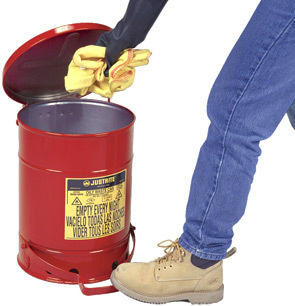 Oily Waste Cans minimize the risk of a major fire hazard - spontaneous combustion of rags and cloths soaked with solvents, thinners, linseed oil, combustible adhesives and other flammable liquids. The self-closing lids of these Oily Waste Cans reduce the amount of oxygen, therefore reducing a key ingredient for combustion. 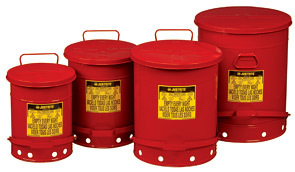 Steel waste cans with self-closing lids - like these Oily Waste Cans - are designed in compliance with OSHA 29CFR 1910.125 and have undergone rigorous tests and quality audits to obtain UL listing and FM approvals.